Many cities are operating without fully understanding their public assets. I was in Boston last week. Apart from the bone-numbing cold, what struck me most was its public transport system, which is much better than in most US cities. The Massachusetts Bay Transportation Authority’s omnipresent “T” signs guided me towards a multitude of subway lines, buses and commuter trains that made a car far less essential than in many other parts of the United States. In fact, Boston is planning to boost its transport system even further by exploring the use of self-driving vehicles in an initiative with the World Economic Forum. While Boston’s transport is good, it’s perhaps still not as good as it could be. One reason is that like many other cities, Boston does not assess the market value of its economic assets. 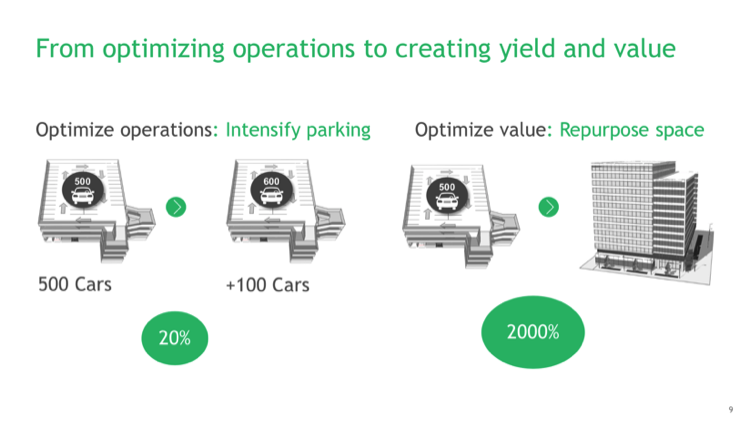 Unlocking the public value of poorly utilized real estate or monetizing its transportation and utility assets – smarter asset management, in other words – would yield a return that would enable it to more than double its infrastructure investments. Through smarter asset management, Boston could improve its public transport system and other services without needing to opt for privatization, raise taxes or cut spending elsewhere. What’s the catch? Actually, there isn’t one. For the last 50 years, government ownership of vast commercial holdings has triggered a phony war between private or public ownership, especially in Europe but recently also in the United States. What matters most is the quality of asset management, rather than whether it is public or private. Compiling an accurate balance sheet – something that is, despite its importance, shockingly rare in most cities – is a crucial step towards adopting a management-focused approach. With a list of assets in hand, and a proper understanding of their market value, taxpayers, politicians, and investors can better assess the long-term consequences of political decisions. Let’s look at Boston. At first glance, the city does not appear to be particularly wealthy. 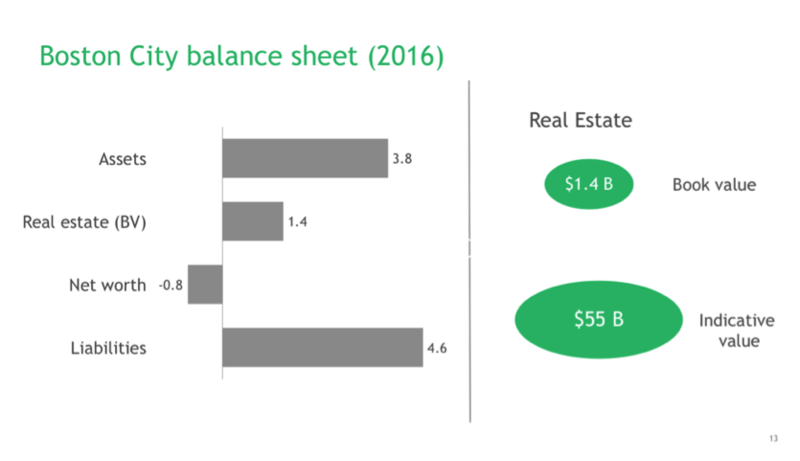 Its financial statements underestimate the true value of public assets, reporting total assets worth $3.8 billion, of which $1.4 billion is real estate. That is slightly less than its liabilities of $4.6 billion in 2015. However, like most cities, Boston reports its assets at book value, which is tied to the historic cost. If holdings were reported using the International Financial Reporting Standards, which require the use of market value for assets, Boston’s holdings would be worth significantly more than what is currently reported. In other words, the city is operating without fully understanding its hidden wealth. And that wealth is vast. An estimate of the market value of Boston’s property portfolio suggests that the city’s real estate alone is worth some $55 billion. But because Boston’s leaders have not accounted for this value, they cannot fully measure the cost of leaving these assets undermanaged. If they could, they would get a sense of the benefits to be gained by developing these assets more astutely. 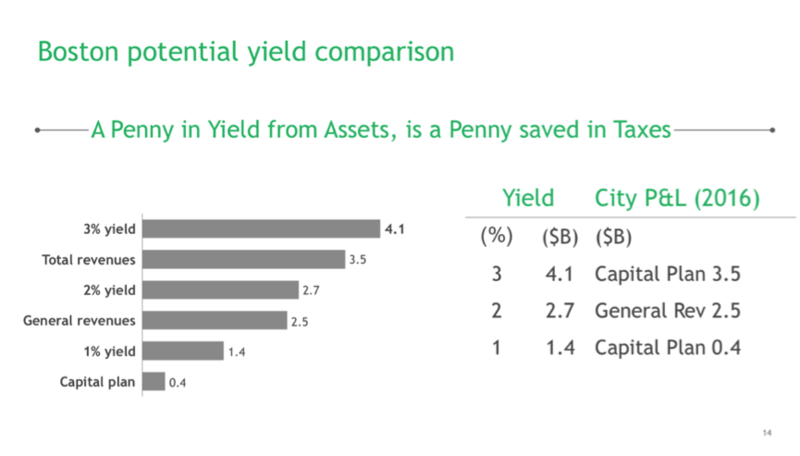 After accounting for the market value of municipal assets, the next step towards sound asset management is to understand the yield that a city earns from the revenue and rising market value of its assets. This is crucial for comparing all investment options, but also for determining whether performance has been satisfactory, and to show stakeholders that their wealth is being managed responsibly. Using Boston as an example again, let’s cautiously assume that the city could earn a 3% yield on its commercial assets with more professional and politically independent management. A modest yield of 3% on a portfolio worth $55 billion would amount to an income exceeding its current total revenues, and therefore enable it to more than double its investments. And Boston is by no means exceptional. On the contrary, its approach to historical valuation is shared by cities worldwide. As a result, public wealth is trapped in real estate and other non-optimized commercial assets. This sounds challenging, but it can be done. Hamburg’s HafenCity GmbH, and parts of Copenhagen that were revitalized by the City & Port Development Company, are just two examples of urban areas that have used this type of development mechanism. These efforts have not only increased the amount of residential housing; they have also funded vital infrastructure such as the Copenhagen Metro, schools, and universities. In Hamburg, the recently opened Elbe Symphony Hall was also funded via a government-owned holding company. Managing city assets better would help local leaders boost their economies, finance social and economic infrastructure, including affordable housing and develop strategies for vibrant and innovative mixed-use projects. Better management of city assets would also help cover the costs of required maintenance without competing with government budgets, leaving more for spending on health care, education, and other social initiatives. Professional management of the public assets that are already in place will ultimately accelerate the development of human-centred, sustainable and affordable urban infrastructure and services. As cities prepare for the challenges of the fourth industrial revolution, this will enable them to develop innovative policies and invest in the future. Dag Detter is a Senior Advisor with The Boston Consulting Group, a former director at Sweden’s Ministry of Industry and a co-author of The Public Wealth of Cities: How to Unlock Hidden Assets to Boost Growth and Prosperity.